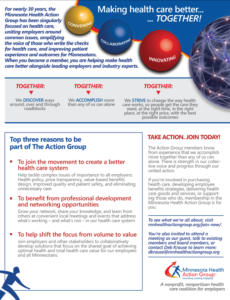 For nearly 30 years, the Minnesota Health Action Group has been singularly focused on health care, uniting employers around common issues, amplifying the voice of those who write the checks for health care, and improving patient experience and outcomes for Minnesotans. Our members are helping make health care better. Click here to learn more about the Minnesota Health Action Group. Not yet a member? Find out what The Action Group can do for you! We welcome employers of all sizes and from all sectors.